I grew up in Detroit and I grew up in Boston. In Boston, you know, we lived in the ghetto. There were a lot of violent episodes there. There were rats; there were roaches. It was dire poverty. I had a mother that worked starting at 5 in the morning, getting home after midnight, from job to job to job. She didn’t like the idea of being on welfare. Most people said, ‘You got two boys; you can be on aid, two dependent children.’ She didn’t want to do that. There’s a difference in breaking the color barrier in somebody who’s had the typical experience and someone who has not. Just because your skin is the same color means you’ve all grown up in the same way doesn’t make any sense. This is where Carson is correct. Nothing about his deciding to use his black cloak to shield his anti-blackness from exposure makes any sense whatsoever. Even still, I have zero interest in joining Carson in vetting President Obama’s blackness for the titillation of white America, primarily because the two are not dissimilar when it comes to respectability politics parroted in bootstrap speeches and the lie that the United States is an inherently great country—when the truth is that it was built brick by brick on the bloodied and whip-lashed backs of ancestors of “typical” black people. What I am interested in, however, is the good doctor’s pathologizing of blackness as a key piece of his platform while seemingly expecting us to believe he was screaming “Whuddup doe?” when roaming the streets of Detroit. He has decided that he has transcended the grime and soot of his “typical” black experience in this country in ways that allow him access to success by white America’s standards. Further, he seems to believe that by growing up in this “typical” black experience, he can give us typical, white answers on how to rectify manifestations of typical, white racism. He has made it his mission to “fight the PC police tooth and nail,” but has very little to say about killers in badges lynching “typical” black people with impunity. If he is nothing else, that makes Carson a dream candidate for a white supremacist system: a black man who is so enamored with his white-smeared perception of his “typical” blackness that he jokes about police brutality and exhibits a clear failure to even acknowledge that it’s a systemic issue fueled by the very racism that is a twisted pillar used to prop up this country—along with sexism, capitalism, ableism, homophobia, transphobia, xenophobia and religious intolerance—all of which the good ol’ boys in the Grand Old Party traffic in as par for the course. This is a black man who will defend the Tea Party for White Privilege of which he is a darling, while excoriating the Black Panther Party for Self-Defense of which he was so “proud” in his youth. A black man who will question the validity of climate change while ignoring environmental racism. A black man who will deny “typical” black women autonomy over their bodies and access to reproductive services, and simultaneously lambaste “typical” black single mothers and absentee fathers for gang violence, all while refusing to address the institutionalized racism that created the conditions in which gangs thrive from Main Street to Wall Street. This is a black man who defines “typical” black as violent, dirty and roach- and rat infested, which leaves a question: What does Ben Carson consider “typical” white? Do his degrees make him typically white? The lie-detector test determined that is a lie. Does his head-bowed and knees-bent respect for authority make him typically white? The lie-detector test determined that is a lie. Does his mother’s ability to avoid welfare make him typically white? The lie-detector test determined that is a lie. 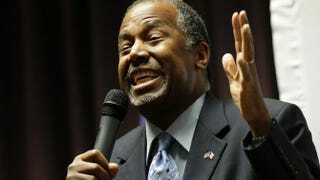 So what “We the People” need Ben Carson, M.N., to do is stop lying. Stop pandering to white voters who are terrified of a “typical” black president, while holding up his “typical” black experience as some exaggerated nightmare straight out of “Tales From the J. Edgar Hoover Crypt.” Stop trying to disguise his need for white validation as black exceptionalism when “typical” black people realize that they are flip sides of the same tarnished coin. Carson’s fraudulent claim to fictive kinship is duplicitous; it is transparent and it is meant to separate him from the “typical” blackness that he embraces when politically expedient, denounces when it’s not and pathologizes at every opportunity. And anyone with “typical” black sense can spot his weak game a mile away.